This time on Go Forth And Game I’m talking to Phil Kilcrease, head honcho at 5th Street Games. 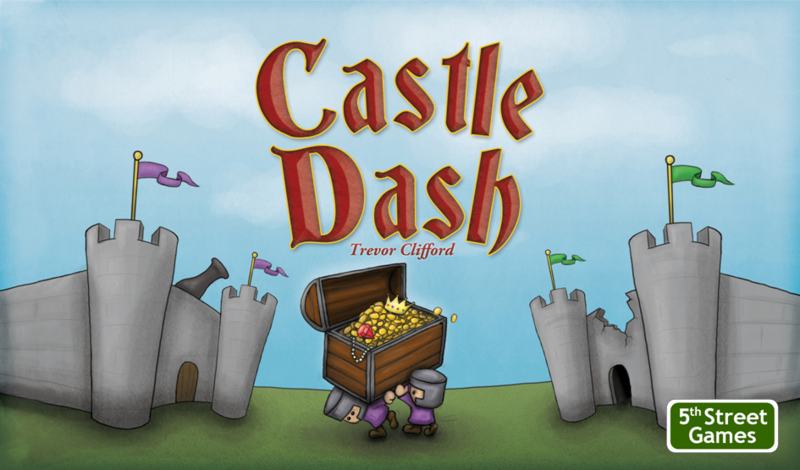 5th Street Games publishes several games – The Crow And The Pitcher, Castle Dash, and Kickstarter darling, Farmageddon. Tom: Welcome Phil. Talk about 5th Street Games a little bit. How did it come about? Tom: Tell us about your games. PK: It all started with Castle Dash. It’s a soldier placement combat game where you place soldiers to attack other players or to gain Armory cards for bonuses in battle. When you successfully attack and break into another player’s castle, you can steal a treasure or rescue a soldier for more options. First to steal three treasures wins the Castle Dash. Crow and the Pitcher had been my favorite trick-taking game for a long time before I picked it up. Players work together to fill a Pitcher card by playing Stone cards that add up to the Pitcher’s value with the highest card matching the lead suit taking the trick. Stone cards are worth one to three points each. If the Pitcher value isn’t matched, though, the lowest card matching the lead suit takes the trick AND the Pitcher card (which is -5 points). After each player has dealt a hand, the highest score wins the game. 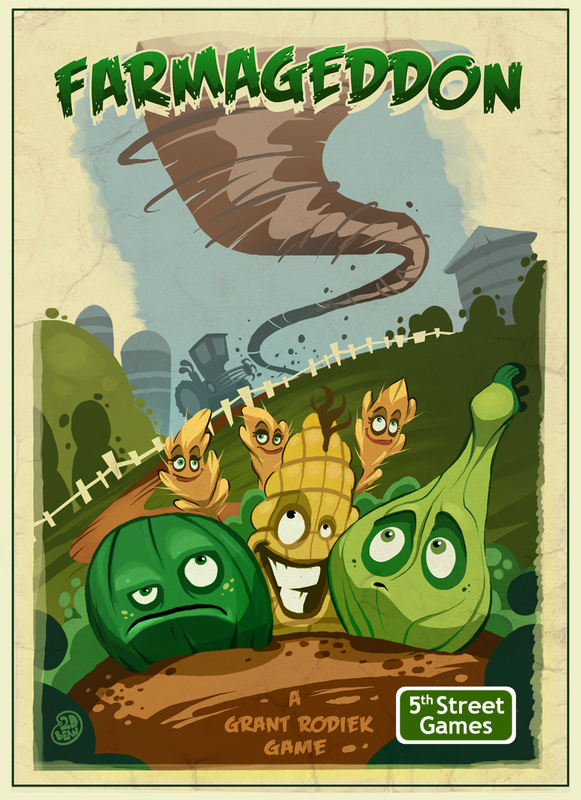 Farmageddon is a hand management game with a dash of Take That. Players are planting crops into one of the three communal fields in hopes of getting enough fertilizer onto the crop to harvest it for cold, hard cash. 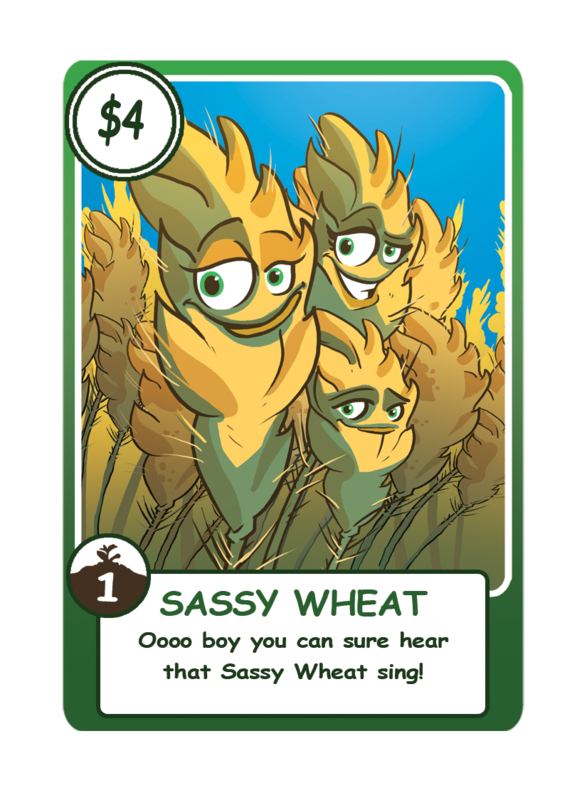 There’s also a set of action cards players draw from that give defensive options (such as harvesting a crop more easily) and offensive options (such as stealing a crop). Once the crop deck is empty, the farmer with the most cash from harvested crops comes out on top. 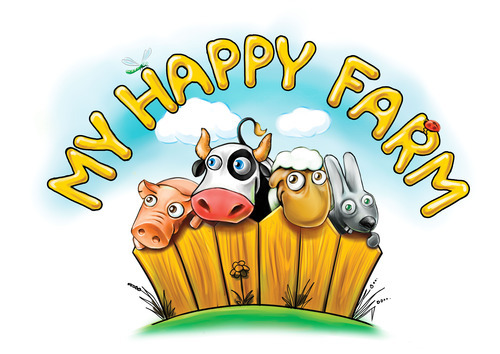 My Happy Farm is our first import and is currently on Kickstarter. 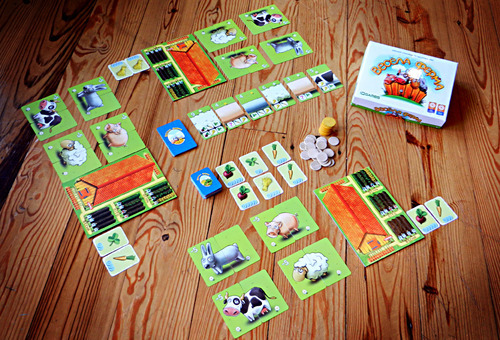 Players each have a farm full of sad animals they are trying to make happy by feeding the animals their favorite meals. Whenever an animal is fed, it doesn’t get fatter; it gets …longer. The more an animal is fed, the longer and happier it becomes. 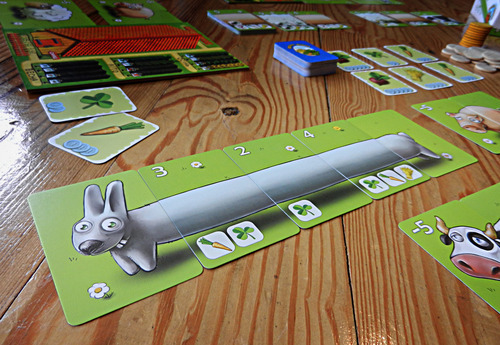 By the end of the game, the player with the happiest animals is the winner. Jungle Ascent is our most recent acquisition. Players are racing to the top of Mount Frab to claim the Ultimate Prize by building a path of bridges, ladders, and conveyor belts to the top while throwing hazards like fireballs and bombs at their opponents. The first player to reach the top claims the Ultimate prize as her own and is the winner. Tom: I’m excited about My Happy Farm. I remember Dice Hate Me liking Castle Dash a lot. And both Jungle Ascent and Castle Dash look fun. Farmageddon had a pretty successful Kickstarter campaign. I’m sorry I missed out on it. What do you think made it so successful? PK: The artwork was a big part of the appeal; Brett Bean and Erin Fusco both did an amazing job evoking such character in each piece. Communication with our backers was also quite important. Grant and I did our best to answer questions quickly while also asking for feedback from time to time. Lastly, I’d say there was a latent demand for the game. It was one of Game Crafter’s best-selling games for a while, and quite a few people knew about it already. The set up for My Happy Farm. Tom: Let’s talk about you’re latest effort, My Happy Farm. Tell me how 5th Street got its hands on it. PK: My friend Alf Seegert introduced it to me at the SaltCON game convention. Halfway through the game, I knew it would be a great fit for 5th Street’s line. Alf put me in contact with its publisher, IGAMES from Ukraine, and we set up a localization agreement. Tom: How do you prototype? How extensive? PK: I print & play; first through black & white, then color as the game improves and has longer periods between iterations. Bit-wise, I pull cubes and such from the collection I’ve built over the years. Tom: What ‘baby’ have you had to throw out? PK: Two in particular: a real-time space civ, and a real-time lumberjack game where you would get to flick down the trees. The space civ was determined to be too niche for the cost, and the lumberjack game ultimately didn’t have enough going on. Tom: Theme or mechanics first? PK: Depends on the project. Unique mechanics are always great, but theme can really make a difference in the development of a game. Tom: Balance in a game – how do you get it? PK: Playtesting. LOTS of playtesting. Think you’re done? Wrong. Keep playtesting. Although, some games don’t need balance to be fun. Bang and Shadow Hunters are both good examples. They both have characters that are stupid powerful, but each game is short enough that it doesn’t matter too much. Tom: How do you know when to stop designing? How much is too much? PK: You can typically tell when a game is done enough; right game length, desired interactions, that sort of thing. When you’re to the point that you’re just changing things to see what sticks, it’s a good chance the game is finished. Tom: What are your two best pieces of advice for aspiring game designers? PK: Play lots of games. It’s good to know what’s been made, and you may be inspired by a particular mechanic. Playtest your games in a variety of ways. Start with conventional strategies until the game feels solid, then start going crazier. Try where everyone is playing an extreme strategy at the edge of your rules. Or with one player doggedly going after an alternate victory condition. Stress test. That’s where wonky rules breakdowns tend to occur. Tom: What are your current top 5 games? Tom: Man, I want to play Super Showdown. 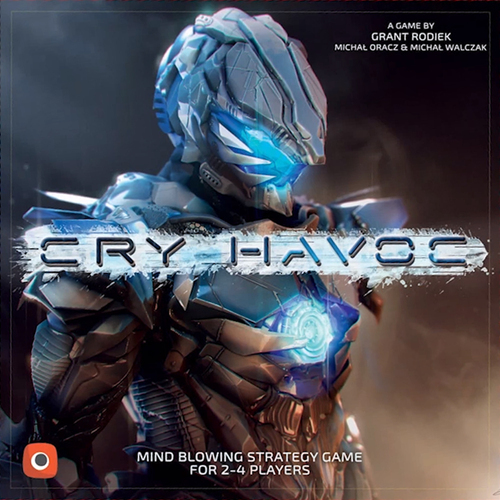 I missed the Kickstarter. Friends played Twilight Struggle at game night on Tuesday and it looked like a lot of cool. So Phil, what’s next for 5th Street Games? PK: We should start having our games appear in FLGSs by mid-summer, so that’s exciting, I’d say. We also have Jungle Ascent to launch later this year and we’re attending Gen Con. It should be a fun rest of the year. Well, it sounds like 5th Street Games is really starting to take off. Like I said, I’m very excited about My Happy Farm and can’t wait for my copy to arrive. It’s been awesome getting to know more about you and 5th Street. Photos courtesy of 5th Street Games and Dice Hate Me.